The Green Parrot’s second edition by Eva Fàbregas is an art work and a promotional material for the exhibition. The composition stems from a 1980s catalogue for car colours found at a flea market. 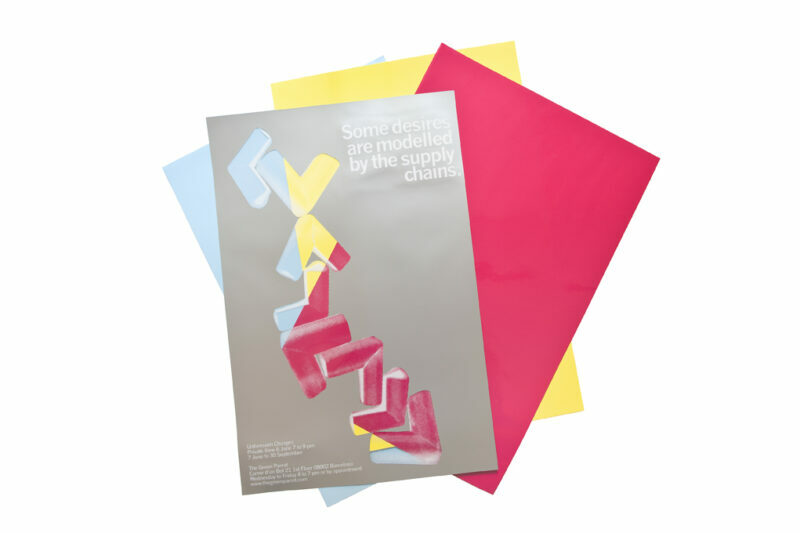 The brochure included transparency prints that allowed for different colour cards to be superimposed so that one could imagine the car in different patterns. The typography and format of Fabregas’ print are reminiscent of the advertisement language of the 1950s, a period during which corporations borrowed aesthetics and techniques from modern art. The sentence on the poster “Some desires are modelled by the supply chains” is a variation of a quote by Marc Levinson’s book “The Box”, in which he looks into the birth of container freight and just-in-time production. These important developments in the organization of production and distribution shifted the focus of the capitalistic system away from manufacturing towards supply, while at the same time shaping our desires of consumption. Eva Fàbregas (Barcelona, 1988) lives and works in London. In 2013 she completed the MFA Fine Arts at Chelsea College of Arts and Design, London. She has had solo shows at PlazaPlaza, London (2013); Espai Cultural Caja Madrid, Barcelona (2012) and La Capella, Barcelona (2011). Recently her work has been shown in group shows at Kunstraum, London (2014); Triangle Space, London (2013); Can Felipa Arts Visuals, Barcelona (2013); Matadero, Madrid (2012); Fundación Botín, Santander (2012) and Lume Gallery, Helsinki (2010).